After Barcelona, I could have easily gone straight to Paris, but when you have the opportunity to pass through the gastronomical capital of France, well, you just can’t pass that up, can you? With Paris on the horizon, I gave myself one day to eat like a true Lyonaise. 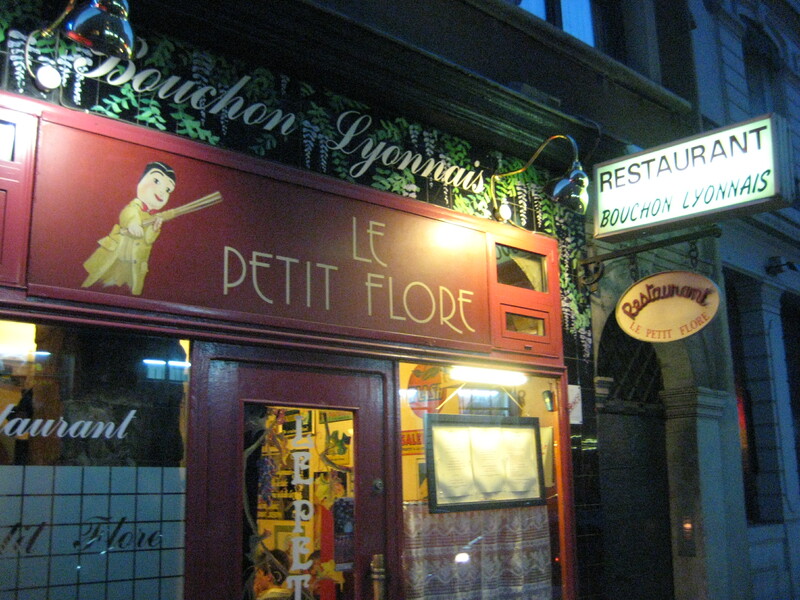 I had read about an authentic bouchon in the New York Times called Le Petit Flore and decided IF I could find it, that would be my introduction to Lyonaise cuisine. 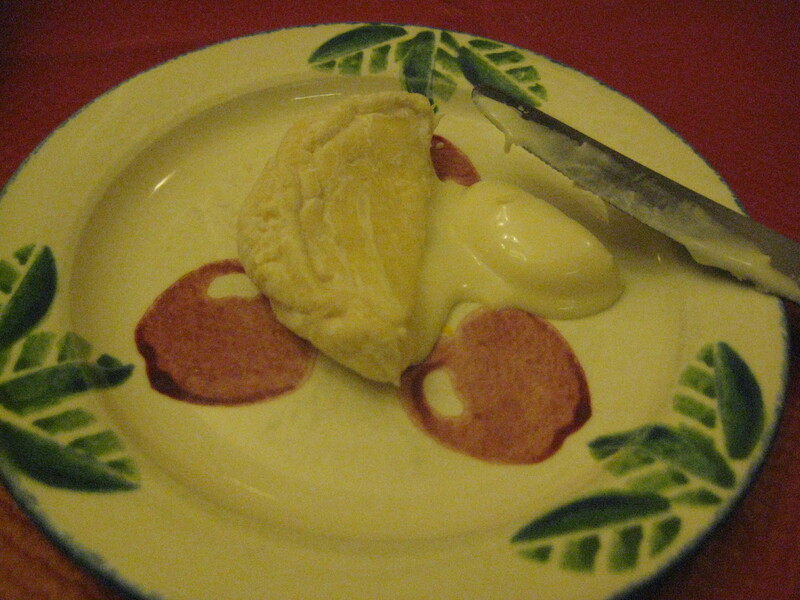 As I learned, a bouchon is a type of restaurant in Lyon that serves traditional Lyonaise food and that’s exactly what I got! I went with the 3 course meal for $18.50 Euro. 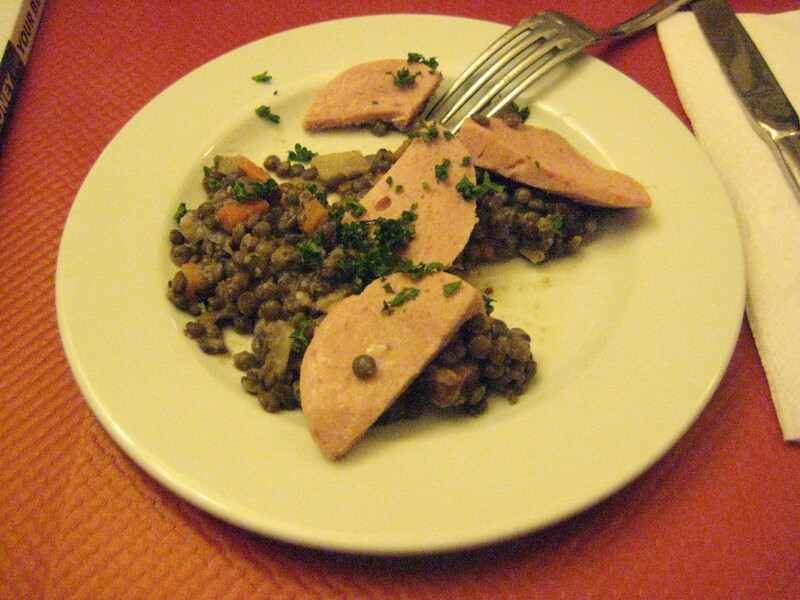 I started with the “La Salade de Lentilles et son Cervelas” which is a lentil salad and sausage. As an added surprise, the lentils were combined with small cubes of bacon. It was comforting and delicious and fit the subtle, understated tone of the checkered tableclothes perfectly. 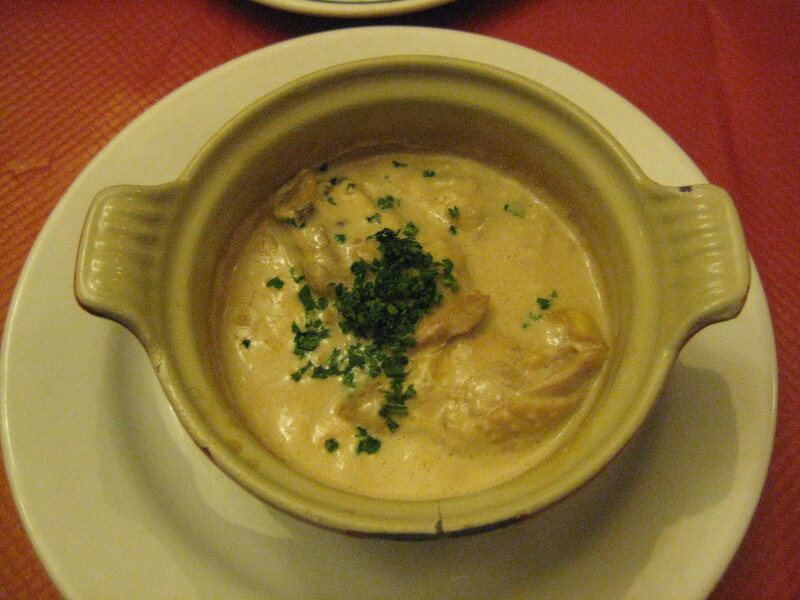 The entree was “Le Poulet au vinaigre”, which translates to “Chicken in vinegar” and doesn’t scream out as a must-have, but I knew it was a classic Lyonish dish that I must have and I’m glad I did. The chicken fell off the bone and the broth “vinegar” was so good that I needed the server to bring me another basket of bread for dipping. Needless to say, I will definitely be attempting to make this very very soon! 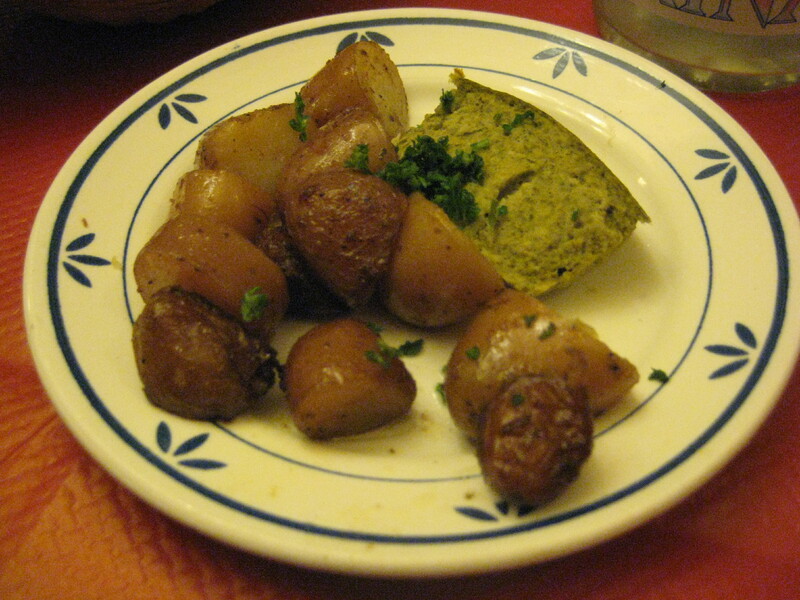 Accompanying the entree was a vegetable souffle, that was light and fluffy and these great little roasted potatoes. Not only did I think they were great, but so did the fellow sitting across the restaurant from me. The woman sitting at the table beside him had taken her son to the bathroom and while she was gone, he nabbed one of the potatoes off her plate and I so caught him in the act! I wasn’t even sure what to say or do, so I just looked at him and shook my head. Vegetable souffle and potatoes worth stealing! 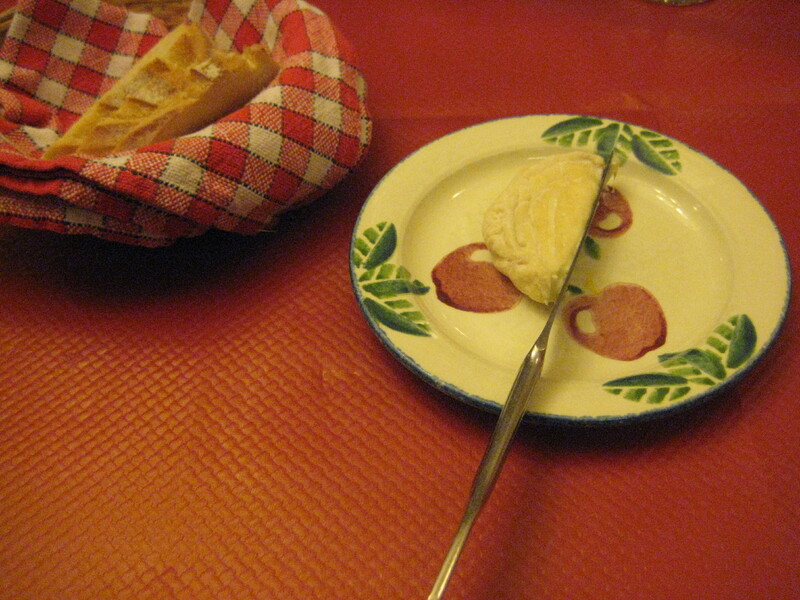 For dessert, I had many options, but I saw the local cheese named Saint Marcellin and I knew that this was going to finish off my Lyonaise meal. Just so I knew exactly what I was eating, I asked what type of cheese if was and I learned that it comes from cow’s milk and it’s soft, creamy and should be served slightly warm. After my first bite, it was obvious why it’s been around for centuries and why it’s revered in Lyon. The meal was a success and because of that, I walked the 4-5 steps towards the kitchen and thanked the chef for the meal (in French of course) and than happily made my way outside for some fresh air to contemplate my Bouchon Lyonaise experience. Any salad that contains sausage and bacon is ok with me. I have to admit, chicken in vinegar doesn’t sound all that appealing to me. Perhaps you’ll have to make the dish to convince me! Well, I do have to pay for my room and board somehow, it’s a deal! Wow, what a great meal. 18 euro is not bad. 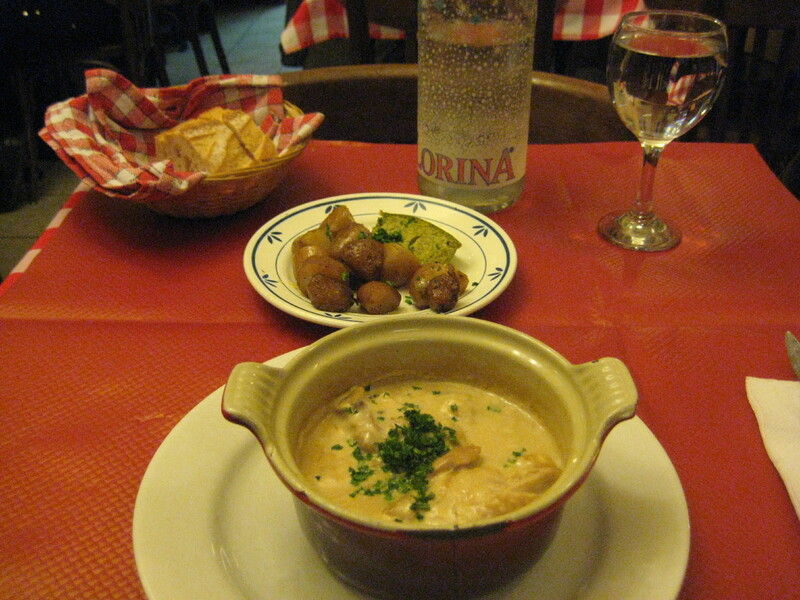 Some of those restaurants in France can be pretty price if you don’t know where to go. I’ve only ever been to Paris but when I return to France I will have to make more time and Lyon will definitely be on my list. Thanks Darina. Yes, you’re right, if you don’t do a little planning, the $ you spend can get out of control! What a meal! And for 18 Euro… not bad! I was an exchange student in Lyon years ago and this makes me so nostalgic! St Marcellin especially. Yummy, oozy cheese… perfection! And yes, lentils with lots of delicious bacon and sausage. Lyon is like the sausage capital of teh world! Maybe not… but should be. Sigh. I need to go back to Lyon!